You may know Sally Timms and Jon Langford from their decades-long stint in the ongoing punk/art experiment The Mekons, Jon's leadership role in the country mayhemists the Waco Brothers, or Sally's country chanteuse alter-ego Cowboy Sally. We suppose there's a chance you may not know them at all. Here's your chance to hear them together. This was originally released as a numbered Limited Edition (2000 copies!) eight-song EP in a special paperboard sleeve with cover art by Jon Langford himself. Once these sold out, people started pestering us for more. Then, our friends in Australia did the work for us and re-released it with four newly recorded songs (tracks 9-12), put it in a jewel case, added some more artwork, and slathered it with vegemite. Then that one sold out, too. 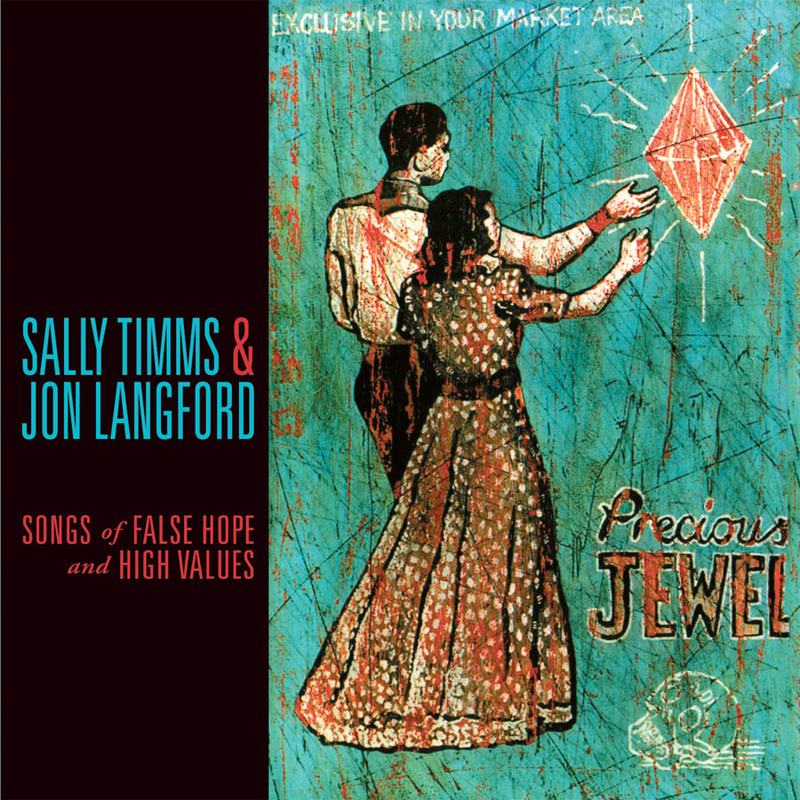 Songs of False Hope & High Values has a stripped-down, but not sparse, campfire feel full of jaunty and crushing songs of hope, desperation and heartbreak. It's a couple of wide-eyed Brits wandering through the vast expanses of America soaking in all the grand myths, disappointments and shattered plans that have become part of the roadside scenery. Restrained, but no less passionate. The band includes Chris Mills on guitar, Tom Ray (Neko Case, Devil In a Woodpile) on bass, Jon Rauhouse on various difficult stringed instruments, among others. In addition to originals, Jon & Sally re-imagine Dolly Parton's "Down from Dover" and "Joshua Gone Barbados" (Bob Dylan, Johhny Cash, Eric Von Schmidt) into songs that could be from a long ago lost empire. It's also STAR TIME for Sally as she sings you to the deep sleep on her version of Willie Nelson's "Blue Eyes Cryin' In The Rain." Arguably the best thing Sally and Jon have recorded for Bloodshot. Every once in a while you hear a recording you want to share with all of your friends...[this album] is just that. 8 country/folk songs that simply this side of heaven. It's a modest, instantly convincing work of folk art. Timms' voice is just so damp and blue, just such a dying ember, just such a drifting memory untethered through the ages.